President Bush heads to Israel and the West Bank this week, hoping his first visit as U.S. leader will open the throttle on Israeli-Palestinian peacemaking. But in the six weeks since Bush declared at an international gathering in Annapolis, Md., that "the time is right" to make peace, two perennial obstacles to Mideast peacemaking have already reared up: Israeli settlements and violence. Even before formal talks began on Dec. 12, Israel announced plans to build homes in areas claimed by the Palestinians. Two Israeli hikers were killed later by Palestinian gunmen in the West Bank, and Israeli attacks have killed dozens of militants in the Gaza Strip in response to ongoing rocket fire. Israeli troops also kept the West Bank militant hotbed of Nablus under siege for several days. Bush's three-day visit, which begins Wednesday, is part of his stepped-up effort to forge an Israeli-Palestinian peace agreement before he leaves office in January 2009. "When an American president comes and tries to encourage the sides to overcome the obstacles and try to solve them ... that always helps the Palestinians and helps us move forward with the process," Israeli Vice Premier Haim Ramon said recently. In an interview broadcast on Israel's Channel 2 TV on Sunday, Bush said he's a known quantity, while his successor might not agree with his approach. Still, he did not predict a full peace accord before he leaves office. "There'll be an agreement on what a state would look like, in my judgment," he said. "I am not going to try to force the issue because of my own timetable, but I do believe that Prime Minister (Ehud) Olmert and President (Mahmoud) Abbas do want to get this done." During the trip, Bush is to meet with Olmert and other top Israeli officials in Jerusalem, and with Abbas in the West Bank city of Ramallah. Bush also is expected to visit Christian holy sites and Israel's Holocaust museum, Yad Vashem. Al Qaeda's American spokesman called on the terror network's fighters to greet Bush with "bombs and booby-trapped vehicles," according to a video posted Sunday. In his weekly radio address Saturday, Bush said he would encourage Israelis and Palestinians to make "tough decisions on complex questions" and pronounced himself "optimistic about the prospects." But Bush aides indicated they didn't expect any major breakthroughs. "Just his going there is going to advance the prospects," said National Security Adviser Stephen Hadley. "We're not looking for headline announcements." What have been making headlines are the deadly clashes and tussles over Israeli construction in disputed territory. Palestinian officials said they would press Bush to support their demand for a total Israeli construction freeze in east Jerusalem and the West Bank. Palestinians claim both areas, captured by Israel in the 1967 Mideast War, as part of their future state. They have complained bitterly about plans to build new housing for Israelis there. The standoff has sidetracked negotiating teams from tackling the core issues of their conflict - final borders between Israel and a future Palestine, sovereignty over disputed Jerusalem, and a solution for Palestinian refugees. Although the Palestinians have agreed to get on with the talks, they will focus on Israeli settlements during the Bush visit, said Nabil Shaath, a Palestinian official. Hoping to defuse tensions, Olmert has said Israel will not build any new settlements, and he ordered Cabinet ministers to seek his approval before authorizing new West Bank construction. He did not halt projects in progress, however, and his order did not extend to east Jerusalem, which Israel annexed shortly after capturing it. But Olmert did take the extraordinary step of acknowledging that West Bank construction was a breach of the "road map" - the U.S.-backed peace plan that is the foundation for the newly resumed talks. "There is a certain contradiction in this between what we're actually seeing and what we ourselves promised," Olmert told The Jerusalem Post daily. The road map, first introduced in June 2003, requires Israel to halt all settlement construction and the Palestinians to dismantle militant groups. Neither Israel nor the Palestinians said they expected any diplomatic breakthroughs from the visit. Instead, they hope to get high-power backing for their often conflicting claims. Palestinian negotiator Saeb Erekat said the Palestinians expect Bush to reiterate his commitment to ending the Israeli occupation, to call for a total freeze on settlement activity, and to identify Jerusalem as the capital of two states. What's more, he said, "We expect him to say if Israel and the Palestinians reach a treaty, the world will stand shoulder to shoulder with them to implement it." Olmert has warned repeatedly that he wouldn't implement any treaty until the Palestinians reined in militants, including armed groups in Gaza that fire rockets and mortars at Israel each day. Abbas controls only the West Bank, after losing Gaza in June to the militant Islamic Hamas. 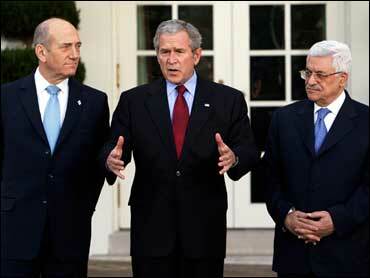 But Abbas' lack of control there has raised questions about his ability to carry out a peace deal. Bush told the Yediot Ahronot daily he would reassure Israeli leaders that Israel would not have to live beside a Palestinian neighbor dedicated to its destruction. "I'm going to promise the Israelis that under no circumstances will Israeli democracy be forced to live with a terror state on its border," Bush said. On Saturday, Hamas declared Bush's visit to be unwelcome. Hamas, branded a terrorist group by Israel and the U.S., is not a party to the negotiations. While Israeli-Palestinian talks will dominate Bush's visit, Israel will also press its concerns about a U.S. intelligence assessment that Iran suspended its nuclear weapons development program in 2003. Israel, which sees Tehran as the greatest threat to its survival, says Iran has since resumed the program.